My work ranges in various themes of landscape, fantasy and the abstract. Through stained glass mosaics, I explore my love of nature, patterns, colors and the hand-made. I often seek out and photograph natural environments through hiking and traveling. Once back in the studio, I translate them into imaginative, colorful impressions. 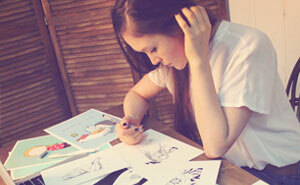 While designing new works, I sketch, always striving to create something new and original. I love coming up with new patterns and giving life to funky creatures and inviting environments. For each composition, I carefully hand pick the stained glass which I then cut and shape into thousands of unique pieces of glass to create each new mosaic. I’ve been working with stained glass mosaics since 2007, shortly after earning a BFA ’06 in Fine Arts from Pratt Institute in Brooklyn, NY. 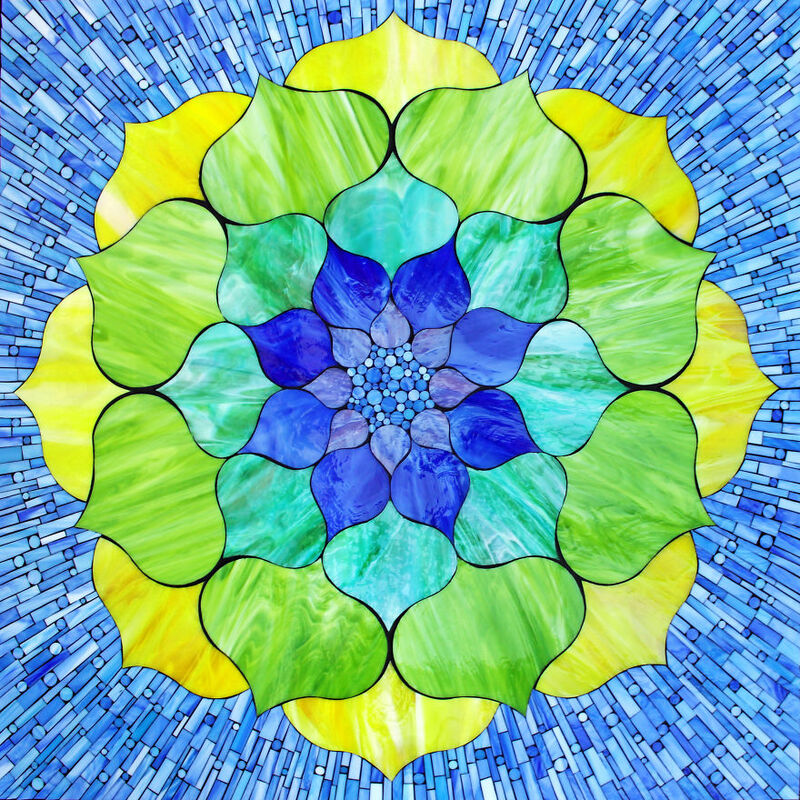 In 2014, I began teaching mosaics due to popular demand from my social media networks. Today though, I mainly focus on expanding my own artwork, hoping to tackle larger and larger works while still offering an online mosaic class to those interested in learning my technique. The varied themes through out my work are a way for me to investigate and to explore whatever I find intriguing. The collection of themes is tied by a common thread of pattern and color. As far as my creative endeavors go, my greatest love, above all else is the landscape. 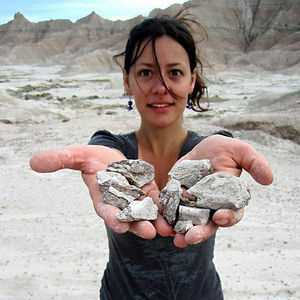 I am captivated by the American West and hope to express that as much as I can. 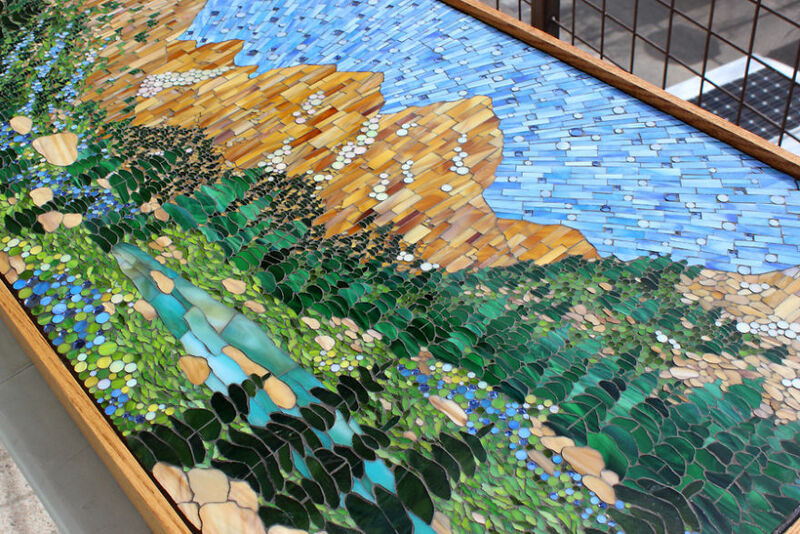 The mosaic above depicts a scene I sketched showing the views from a backcountry campground in the Teton Mountains of Wyoming where I camped during my first visit backpacking trip in the park. I create vivid, bright compositions in glass as a reaction to what I find most beautiful, curious, and stimulating. This piece was inspired by an early Spring day in Boulder, Colorado where I used to live. 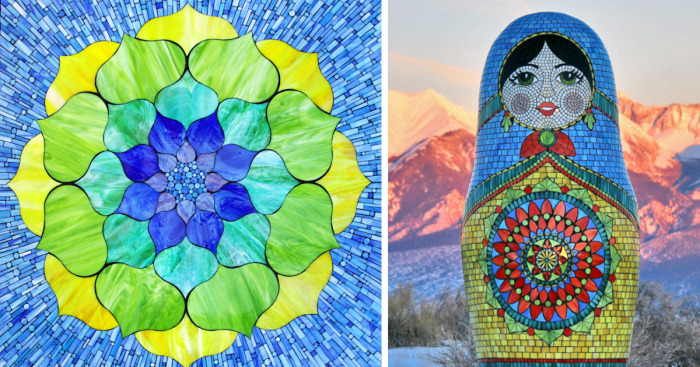 Most recently I’ve collaborated on an outdoor mosaic sculpture with sculptor, Kyle Cunniff. 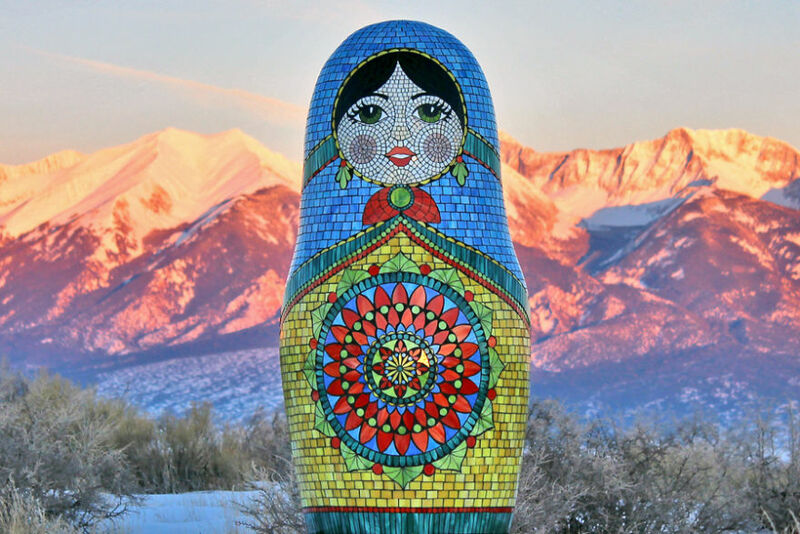 Here she is set against the Sangre De Cristo Mountains in the San Luis Valley of Colorado where I live. All the circles in this mosaic (as well as in all of my work) are shaped individually using tile nippers and arranged into a balanced composition. I draw my creativity from the magic, mystery and magnificence of Mother Nature and my surroundings in the Rocky Mountains of Colorado. This piece for example was inspired by the golden aspens set against the San Juan Mountains near Telluride. With this owl I wanted to show its serious poise and the grandeur that these birds exude often looking down at us (or at their lunch) from high up in a tree. Every time that I spot an owl in a tree is feels like magic – I really worked to capture that. This owl is one of my all time favorite characters. The whole time while working on him, I smiled and laughed most of the way through. I photograph my surroundings which are later reborn as glass mosaic monuments to some of the most special and beautiful places through out the United States. This mosaic is inspired by my trip to the Mt Hood region of Oregon. I love the hand made aspect of mosaics. Every mountain, every tree, every circle, trapezoid,etc. is individually hand cut by me and placed into the mosaic one by one until the image becomes whole. I'm a Colorado based artist and nature enthusiast. My work ranges in various themes of landscape and fantasy. 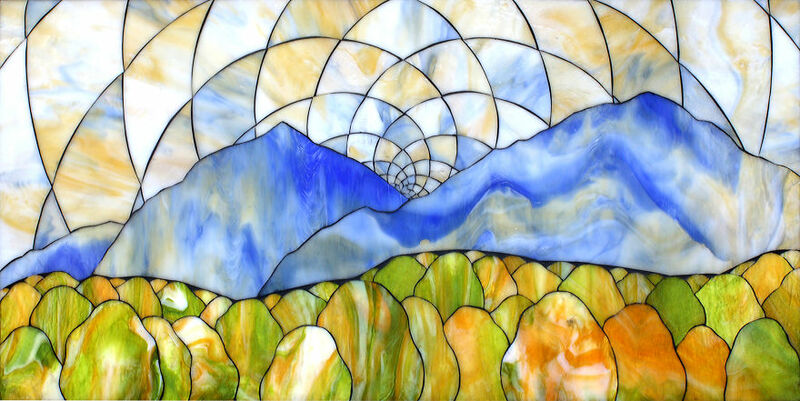 Through stained glass mosaics, I explore my love of nature, patterns, colors and the hand-made. Love looking at Kasia's mosaics. She has such an amazing color in her landscape and floral mosaics. She has proven to be a very patient , helpful and inspiring teacher. Jackie, thank you so much for your wonderful compliment! Kasia creates stunning works of art. An awesome teacher, as well. Thank you so much for reading the article and for the lovely compliment Candace!!! I have seen your work in person and although these photos are beautiful, seeing them in person took my breath away. Exquisite artistry! Hey Dee, photographing mosaics is definitely a unique challenge. We always try to get the best shot but in the end seeing the work in person really is best. Thank you so much! Michelle and I really want to see your work in person, and to meet you two. If you do a Dallas tour, please tell us in advance.